When it is nearing the time to introduce solids to your little one you will be able to pop him in the highchair for short periods so he becomes familiar with the chair and the feel of sitting upright for longer periods of time. All babies differ when it comes to sitting up on their own. From approximately four to five month’s, most babies will be capable with a little assistance to sit for short periods in a sit-me-up baby chair, play seat or inflatable baby play ring. If you do want to invest in one of the above you will find examples of these at the end of this article. A baby can be also propped up with the aid of cushions on his playmate however it is important to stay near by because until he can sit comfortably on his own he could very easily topple over as it takes time for him to develop strength in his back muscles. Below are examples of Sit-Me-Up seats available. Click on a product to find out more or to purchase. 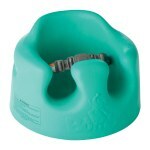 This seat can also be used in the bath for an older baby. The next stage would be a high chair, as by six months you will be introducing your baby to solid food. 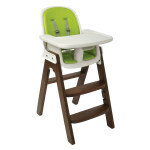 A highchair needs to be safe, sturdy, durable and easy to clean. You will possibly want to buy a highchair that you can manoeuvre easily, particularly if you intend moving it from one room to another. A strong harness will also be required to keep your baby safe particularly when he first starts to sit in a highchair. When first considering buying a highchair it can be worthwhile looking online at the research carried out by organisations such as Which. ‘Which’ carry out rigorous safety tests on many baby products and give recommendations to a wide rang of highchairs that they consider to be safe, stable, durable and easy to manoeuvre. They check for finger traps and tipping hazards, whether the highchair has sturdy locking mechanisms and a strong durable tray to keep your baby safe. Highchairs can be bought from any reputable Nursery Furniture stockist. The strength and stability of the highchair is paramount when making a decision on which one to purchase. 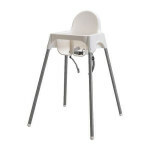 It is also a good idea to look for an easy to clean high chair which does not have cracks and crevices where small particles of food can become trapped and difficult to remove. Ensure the chair has a secure and sturdy harness to strap your baby into the chair: you may want to consider a chair which will also last for as long as it is necessary for your child to sit in a highchair, or in an elevated chair at the table such as the Stokke, Tripp Trapp. Selecting a highchair is a very personal experience because you will want to select a chair that meets you and your child’s needs, taking in to account the price and durability of the chair and whether or not you intend having more than one child. Tripp Trapp chairs provide seating for your child up to the age of three or four/five or until they are eventually able to sit in a chair and can reach the table top. An older child can also carry out activities in a Tripp Trapp style chair i.e. Colouring and drawing and it is wonderful to be on the same height as Mum or Dad when eating or when they are working at the table. 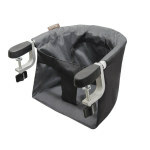 There is an extensive selection of highchairs on the market, below are some examples of these. Click on a picture to find out more or to purchase.